What is the McOmber Reading Program? The McOmber Reading Program is a phonetic based LEARN TO READ program for beginning or struggling readers of all ages. This program combines phonics and sight words to cover all aspects of the English language. This enjoyable, easy to use program includes 52 readers paired with 52 writing activity booklets and a Teaching Guide. The 52 readers introduce step-by-step basic skills for learning to read and write the English language. The writing booklets reinforce reading concepts and enhance writing and spelling skills. The Teaching Guide provides easy to use instructions and ideas to ensure success. The McOmber Reading Program makes learning to read fun and successful for all involved. What Makes the McOmber Readers Unique? Combines phonics and sight words to cover all aspects of the English language. All 52 books are in sequential order, always reviewing what has been learned previously. Skills are introduced step-by-step starting with the simplest words and patterns in the English language and progresses gradually through the more advanced phonetic concepts needed to be a successful, independent reader. Each reader is paired with a Writing Activities Booklet that reinforces reading, writing and spelling skills. Each reader has a Preview Page that gives teaching instructions and the new letter sounds, words and the concepts needed to be introduced to the student. It also includes Reading Helps that contain key English language concepts. At the end of each reader is a Literacy Skills Review page with a Word Family box containing rhyming word patterns that increase vocabulary. It includes comprehension and conversation questions which check for knowledge of details and develop thinking, analyzing and problem solving skills. Important true-life values are brought to life in each story. Fun, family oriented, ethnically diverse characters appear in beautifully illustrated, real-life stories. Rachel has devoted her academic life to studying how individuals learn to read. She has chosen a team of experts to enhance these findings and develop 52 delightful phonetic readers. Rachel has taught in private, public and charter schools. She owned and operated a highly successful academic preschool and kindergarten for 22 years. She has authored and published over one hundred phonetic reading and writing materials for beginning and struggling readers. Rachel was a participant at the UCLA evaluating/testing services and has been a curriculum planner and materials coordinator for the Early Childhood Association. She has produced a variety of literacy materials and has helped thousands of individuals with reading skills. She has helped create and has served in numerous literacy organizations and has been a consultant and organizer for various educational programs. Her favorite educational activity has been to see the light of discovery that comes to individuals as they learn to read. The McOmber Readers in greater detail. 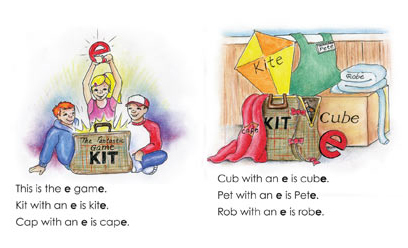 The McOmber Readers offer a sequential progression of phonetic sounds, blends and sight words for beginning readers, always reviewing what has been learned previously. This deliberate progression not only facilitates learning to read, but to write and spell decodable words. This special curriculum is presented in an appealing format of cumulative stories featuring the same interesting characters. Each McOmber Reader focuses on specific skills and is based on character development and values. This series builds a firm foundation for beginning and remedial reading. Because of this focus on basic skills, the series of McOmber Readers is a successful tool for remedial students and a vehicle to teach English as a second language. This program is an easy way for students to learn phonics with meaningful, sequential and connected text. The 52 full color reading books are beautifully illustrated, humorous and enjoyable. The illustrations spark story interest and enhance the pleasure of reading. The interesting stories describe the adventures of an ethnically diverse group of young friends with their pets and their families. They have been written so that young students using them can relate these storybook friends to their everyday activities and language. A Preview Page is included in the front of each book which outlines the skills necessary to read the book and how to teach them. The program combines phonics and sight words to cover all aspects of the English language. The text of the books is carefully selected to develop these skills sequentially, using a precisely controlled decodable vocabulary. A Review Page is located at the back of each reader which presents questions designed to build comprehension and confidence. These tools help students discover the joy of reading without stress. Teaching with the McOmber Readers can begin at the earliest comprehension level and invites parent involvement. Early phonics training enables the student to form accurate spelling patterns and thus eliminates guessing. Reading is a process involving the discovery of new words by the reader. In the first 25 books of the McOmber Readers, the short vowels (aeiou) are introduced along with vital sight words. Students increase their word skills by beginning with the simplest word patterns in the English language and gradually progress through the skills needed to become a successful, independent reader. The reading process is heightened by the Writing Activities for McOmber Readers. Each McOmber Reader has a 12 page corresponding Writing Activities Booklet. These activities give the student an introduction to the new sounds, letters and words and give the student writing practice and word meaning that reinforce the matching McOmber Reader.